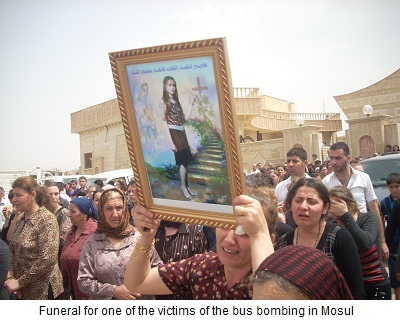 (AINA) -- Over half of the 1.4 million Christians who lived in Iraq before the 2003 invasion have fled the country. If they could, most of the others would have departed as well if some nation was ready to take them in. Nearly every human rights organization and numerous parliaments are in agreement that an ethnic and religious cleansing has been underway in Iraq (report). Non-Muslims are not welcome any longer in large segments of the country. Kidnappings, rapes and executions are daily occurrences for the non-Muslims of Iraq. Sixty churches have been bombed, sometimes systematically on the very same day in different places in the country. One of the worst attacks happened on May 2nd. A busload of Christian Assyrian students was attacked between two checkpoints. In the place where they should have been safest, two roadside bombs were detonated. The next morning I received a video taken with a mobile telephone at one of the hospitals where the wounded and injured students were being cared for (Watch video of victims at hospital). In Sweden there are thousands of Assyrian Iraqis hidden from the authorities because they have been rejected as refugees and are forbidden to remain in Sweden. They are hunted down by the Swedish police. If they are arrested, they are put in prison or in custody until the authorities have enough refugees to fill a plane with which to fly them to Baghdad. They are dumped by the Swedish police back to that very city where they can be slaughtered for their religion or ethnicity. During the past two years I have followed some thirty persons who have been forcibly expelled. Nearly all of them have fled Iraq again. In the beginning of last week one of the refugees I helped conceal informed me that "a pregnant refugee woman looked for a hospital where she could give birth but the local hospital refused to accept her. She desperately needed a caesarean and they wanted her to pay SEK 50,000 (7,000 Dollars) which she did not have." Two days later the organization Läkare i världen, (Médecins du Monde) in Sweden (which helps refugees who are hiding) arranged medical care for this pregnant woman. The woman's husband and I spoke about the consequences of the war in Iraq and the Swedish authority's cynical treatment of those who have fled for their lives. He showed me a photo of his brother and said "It made no difference how much evidence that my brother presented to the Migrationsverket (The Migration Board) and the Migrationsdomstolen (The Immigration Court): for example threatening letters and a list of people who were to be executed. Despite all this they sent him back. Shortly after he was dumped back in Baghdad he was kidnapped by the very same Islamist group that he had described to the Migration Board. The group later returned him as a corpse." On Tuesday May 4th, I was at the Migration Board's main office in Norrköping. Fredrik Beijer, the chief of staff at the Board, had called a group of activists from the Swedish and Middle Eastern churches to a meeting. Among them was the Bishop of the Eastern Assyrian Church, Mar Odisho Oraham, as well as the Swedish priest Henrik Törnqvist. This was because the action group and I had collected 88 cases that concerned Christian Iraqis who had earlier been rejected. The chief of staff of the Board wanted to examine these cases to find out if the Board had made any errors in those that concerned Christians from Iraq. But he claimed that he couldn't find any errors. "A number of them had remained in the country (Iraq) after the threats began," Beijer claimed, among other things. I replied that it is correct that they had fled from their homes to hide among family and friends until they could find a smuggler who could help the leave Iraq. In some cases, those who had hidden them had been exposed and were forced flee in turn. The four people who represented the Migration Board that Tuesday obstinately claimed that "the people whose cases had been submitted had remained in the geographic area (Iraq) after the risk had become apparent" -- playing with words. The Board's head jurist, Mikael Ribbenvik, did concede that "as the situation has improved with time, it has become much worse for minorities." But it became obvious that this was of no help to those who are currently in hiding to be permitted to remain in Sweden. The Board did not feel that their fears were "well founded." Not a single perpetrator, not a single terrorist who has kidnapped, raped or killed a non-Muslim has been convicted in Iraq. The country now has a constitution based on an interpretation of the Koran. During Saddam's regime nearly all who applied for asylum to remain in Sweden received it. We knew that he was certainly a brutal dictator and people needed protection from him. Now in the midst of an ongoing genocide, minorities get rejected by the Swedish Migration Board. Since it has become worse for non-Muslims in Iraq today, Sweden cynically sends them back there. I cannot reconcile these facts. The Board claims that there is no systematic persecution in Iraq. This despite the fact that everyone else, among them the foremost experts in the world, claims that it is ongoing. When I relate about persons who have been expelled from Sweden and managed to flee to Syria and other bordering countries, where they obtained refugee status from the UNHCR, this has no effect on the Swedish decision makers. When I relate that I have taped the voice of a Swedish civil servant working for the Board who has even encouraged Christian Iraqis to flee again as soon as they have been arrived in Iraq, Mr. Beijer red-faced and said "we are thankful that you informed us, it is unethical behavior which we want to know about." Several employees at the Migration Board, who have been forced to hold a so-called returning interview with Christian Iraqis, feel ashamed. They are aware that these people should not be expelled but instead be protected. This is the way the interviews sound: "I know it will be difficult for you in Iraq but I have to tell you the way it is. If you agree to be expelled to northern Iraq where it is relatively safe we will not hand over your case to the police. If not, the police will hunt you down, arrest you, keep you in custody, force you on a plane and dump you in Baghdad. My advice is that you agree to do this voluntarily, in which case you can receive 30,000 kr ($3,900) as a resettlement fee. Take the money and flee to Syria." This is the conversation that Beijer claims is unethical. That I, an investigative journalist and author, should hide refugees would certainly be considered unethical by Sweden's migration minister Tobias Billström. He probably would have like to make the hiding of refugees illegal. In that case I will accept the punishment. I am proud that I can help. I want to continue to be proud of Sweden's reputation of being one of the most welcoming countries for people who have fled to save their lives. I am ashamed about the current "unethical situation." An unjust law is no law at all. As a reply to my reaction to Beijer's statement about the Board employee whom he claims acted unethically, he wrote to me the next day: "My reaction to your information regarding what an employee of the Migration Board had said, only concerned that I don't believe that it is the employee's duty to advise the person being interviewed how they should act after a future return to their homeland. How much one should like to do so, we cannot mix ourselves in the applicant's life after they have departed our country." No, but we can see to it that they are not sent back as long as there is a risk that they will be killed. As I was writing this text I was interrupted by a Christian Iraqi in hiding. He had just received a rejection by the court. Before fleeing from Iraq his brother had been beheaded in front of his eyes; the Islamists released him later so that he could tell other Christians of what had happened. This is a man who witnessed something horrible, a man whose name is on a death list, and a man that Sweden wants to send back. Two Iraqi ministers have, in the media, asked that Sweden should stop sending back persons that Iraq cannot protect. Why do we do this? It's not enough to say that the law isn't adequate -- we must change it now. To the international community I say: Protect the non-Muslims in Iraq before it is too late. The majority of them are found in the northern part of the country, in what is known as the Nineveh Plains. This must become a defended protectorate. How many more must die? How many more have to be forced to flee. The United States must take its responsibility. It behooves the EU and the UN to take on this responsibility as well. Journalist and author Nuri Kino has been called by several human rights organizations one of the leading experts on the consequences of the war in Iraq. Kino has produced six radio documentaries on this subject, two TV documentaries, written a book of reports on the plight of the refugees and in the fall he will have a book published called "The Line in the Sand" that he has written together with the American journalist David Kushner. He has also lectured about the war at several universities and parliaments about the situation faced by non-Muslims in Iraq.